The European earwig is ½ to 1¼ inches in length and easily identified by forceps-like appendages. I typically don’t mind creepy crawlers that we can find in the home, on a hike or even in the garden. I like spiders – the only ones around here to steer clear of are black widows, and they don’t like you either. Spiders are beneficial insects, eating soft-bodied pests like aphids, leafhoppers and even the occasional caterpillar. But this year there are two insects (really the only two that make me a bit uneasy) that have been especially bothersome. One of which I will talk about this week and the other next week. The dangerous-looking European earwig is an elongated, flat insect, reddish-brown to black in color, and ½ to 1¼ inches in length. The earwig is easily identified by forceps-like appendages (cerci) found at the base of its abdomen. These cerci are what scare children and adults alike, but it’s their attraction to young seedlings and flowers and inside heads of lettuce and cabbage that can drive one mad. When populations are high enough, they can easily defoliate a young seedling. 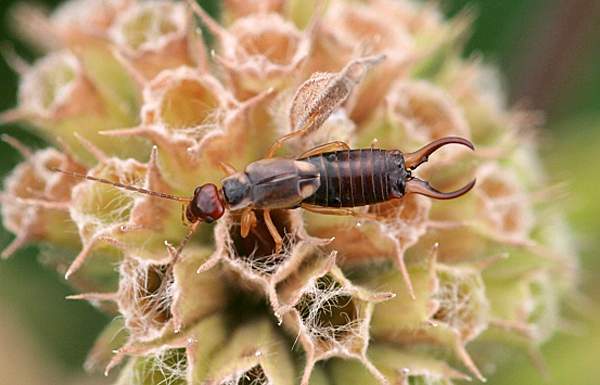 Earwigs typically feed at night, and as day breaks, they seek shelter in a dark, moist spot – like flowers or between the leaves of lettuce or cabbage. Using a shallow tin can, fill it half full of vegetable oil, and bury it in the garden so about a half inch is above ground. This swimming pool is enticing, but the oil will quickly smother and kill the insect.In the late evening hours, earwigs will seek shelter. Place a rolled-up newspaper or cardboard tube in between plants in the garden, as this will provide the shelter, the darkness and the moisture that they are looking for. Then every morning, empty the trap into a bucket of water or the trash.Remember to shake out your cut flowers before bringing them inside and to submerge your heads of lettuce and cabbage in water for about 30 seconds before using. Next week, I will discuss control of the grasshoppers, another pest that seems to be running rampant this year. And yes, if a grasshopper lands on me, you will see me jump. Just like a grasshopper.